If you love hiking, (and who doesn't?) You'll love Liberty! Remember the movie 'Back to The Future', where old man Peabody was so infatuated with pine trees that they named the mall after the twin pines on his farm? Of course by the end of the film, the mall was named Lone Pine Mall to reflect its altered past. Liberty has its own fascination with trees. 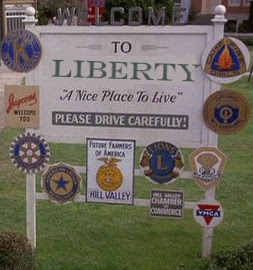 From the town seal, to Eight Oaks Trail, it's no wonder we say "It's a Nice Place to Live" just like Hill Valley. For me, the saddest part of Liberty, in my opinion, is the West Liberty High-School known colloquially as "The Old School", in what was once, and often commonly today is still called West Liberty. The school, closed in 1966 and was the newest of the Randolph County's schools at the time. Racial integration occurred, but due to opposition and racism at the time from white residents, the decision was made to bus black students to the older "white" school downtown, rather than have them endeavour into "black" side of town. A million dollar decision that left the Old School, abandoned for all time to whither in time. Today it still sits vacant, untouched since those fateful days in American history where the destiny of this school was determined. By doing so, more than just a high-school that was closed, it "meant a loss of community and pride." (cite) It was "devastating." Is Liberty, Main Street for Hollywood? 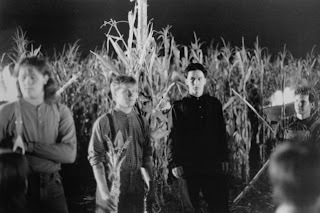 Children of the Corn IIShot in an incredible 23 days in the corn fields of Liberty, NC; director David Price has expressed enjoyment in filming within a small town. David says "there's no red tape involved and people are eager to get involved with the production. Everyone was treated like a celebrity. Everyone was asked for their autograph. We had production assistants who were asked for their autographs." A Tale of Two Parks. 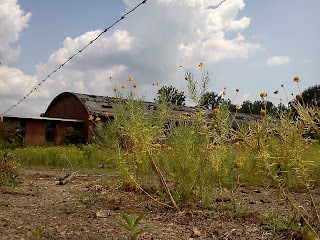 Established in 1976, made possible by a gift of twenty-two acres from TexFi Industries, INC. Freedom Park is the largest of Liberty's Natural parks. Should the Daniel Boone Marker be restored? If you didn't know, Liberty once home to Daniel Boone marker number thirty-two. It was destroyed in the famous 1959 car wreck, and was never replaced. It could be duplicated, and restored if the town chose to restore its historical marker to downtown. I can't think of any better way to embrace the past, than restore it in the future, personally. Dedicated around 1929 and destroyed in a car wreck in 1959. Liberty is the official home of Daniel Boone marker 32. 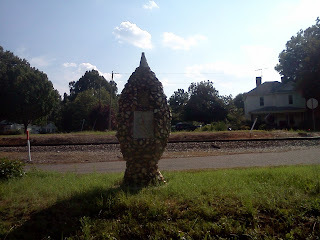 Once located on the corner of Greensboro and Fayetteville Streets, the monument is one of 358 erected between 1913-1938 by the Boone Trail Highway and Memorial Association. Designed to persuade legislators to improve North Carolina Highways, it eventually would represent memorial, patriotic, and educational objectives nationwide. For the record, Staley's Boone marker still stands, near the railroad tracks in the center of the town.